Set a heatproof bowl over a pot of simmering water. Chop the chocolate and add to the bowl. Once mostly melted, whisk in heavy cream and honey. Whisk until completely melted, remove from heat, and cover to keep warm. Toast walnuts in a frying pan for approx. 5 min., or until golden all over. Transfer to a cutting board and chop, then set aside. In the same frying pan, melt butter and brown sugar over medium heat. Meanwhile, peel the bananas, slice lengthwise, and then halve. Add the bananas to the pan and sauté for approx. 1 min. on each side, or until lightly caramelized. Sprinkle with cinnamon and remove pan from the heat. Add rum to the pan. Carefully flambé the sauce with a flambé torch. Gently toss the bananas in the flaming sauce until the flame goes out. Remove the bananas from the pan and heat the sauce over medium heat, whisking until it reduces to a thick caramel consistency. 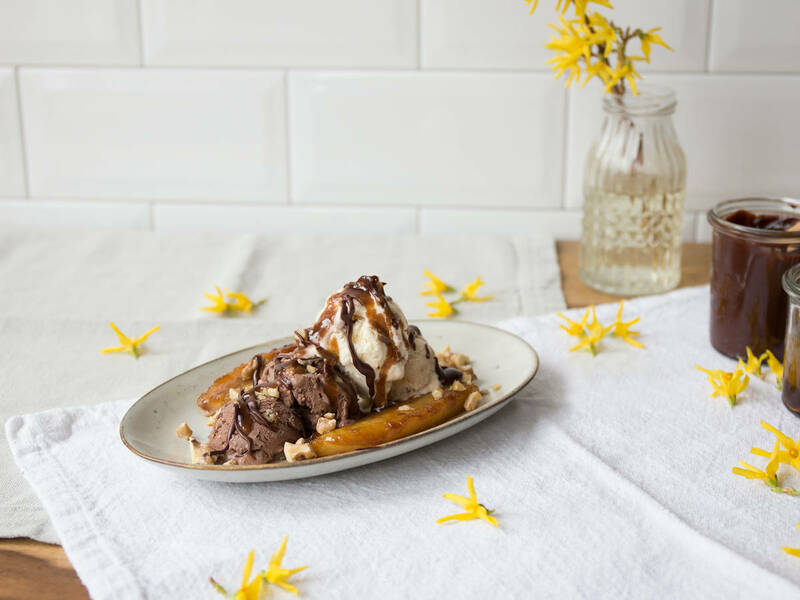 To serve, add one scoop each of vanilla and chocolate ice cream to a bowl or classic ice cream split boat. Add two pieces of banana to the side of each boat and drizzle each evenly with the remaining Foster caramel sauce. Top with chocolate sauce, toasted walnuts, and a dollop of whipped cream. Enjoy!